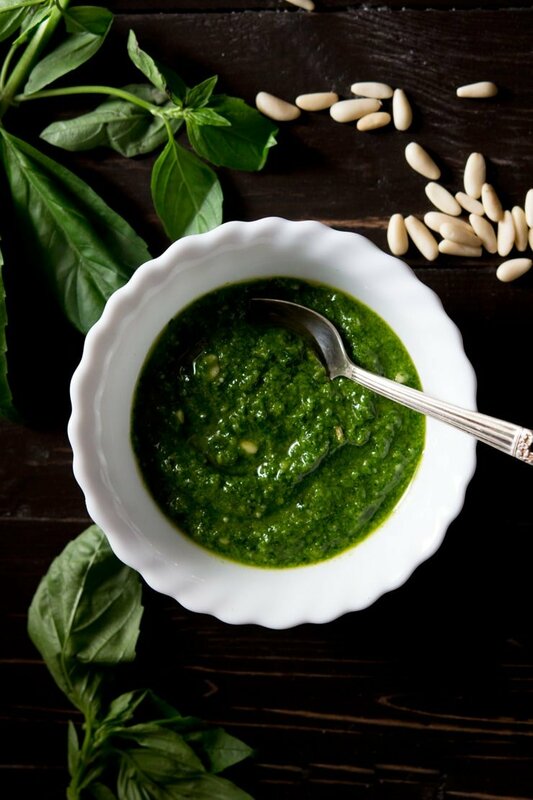 A classic and basic recipe for how to make basil pesto (A.K.A the best sauce in the world). 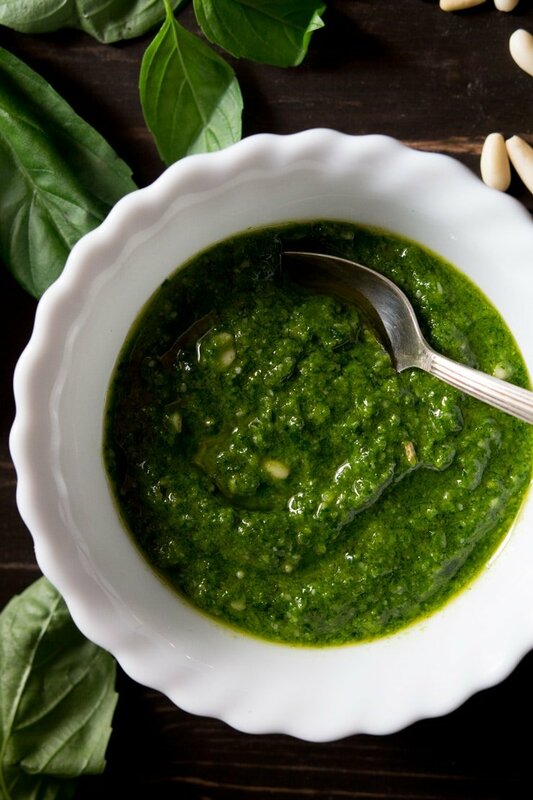 Made with only five ingredients this intense, flavour packed basil pesto is perfect for dressing pasta, salads, on sandwiches, pizza and so much more! This has to be my favourite “sauce” ever, I mean whoever discovered that fresh basil, pine nuts, garlic, pecorino (or parmesan), and olive oil all mashed together makes the most incredible tasting green gold that makes anything and everything taste good (seriously) THANK YOU! 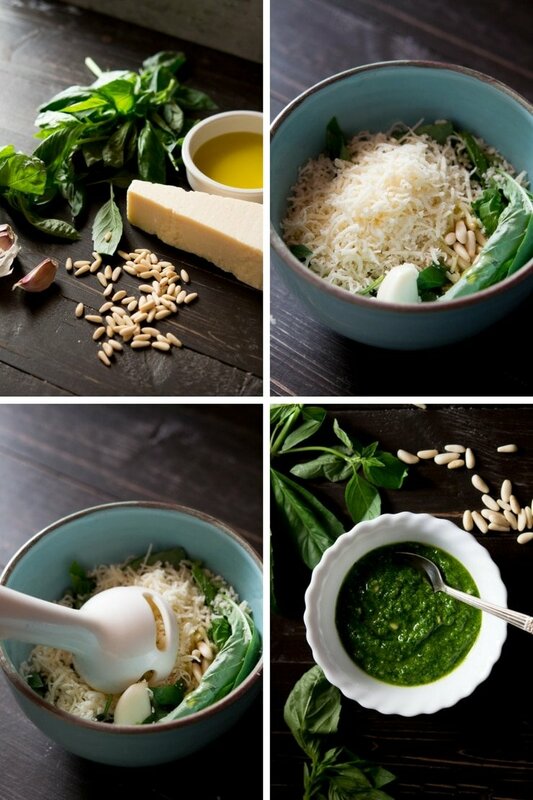 Basil pesto originates from Genoa, Liguria and is traditionally made in a mortar and pestle. The authentic recipe uses pine nuts although if you don’t have them cashews, pistachios, almonds and walnuts all make great substitutes it’s also delicious with a little chilli kick. I had it this way once in a small family restaurant in Siena and it inspired me to create this gnocchi with walnut and chilli pesto recipe check out the recipe if you fancy adding a little spice to your pesto. Add all the ingredients to a bowl and blitz everything together using a hand-held (immersion) blender to create a smooth sauce (add more olive oil if necessary). Super easy right? 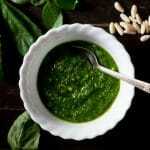 Boil some pasta and toss the pesto through it, dress spinach for a side or salad or spread it on sandwiches. Also be sure to check out my sun-dried tomato pesto recipe it’s just as easy and can be used in so many ways. If you’ve tried this or any other recipe on the blog then don’t forget to rate the recipe and let me know how you got on in the comments below, I love hearing from you! You can also FOLLOW ME on FACEBOOK, TWITTER, INSTAGRAM and PINTEREST to see more delicious food and what I’m getting up to. Put all ingredients in a bowl apart from the salt and pepper and blitz into a smooth sauce using a hand-held blender (or use a food processor) then season with a pinch of salt and pepper. Add more olive oil if necessary. i am a huge pesto fan lately! I’ve never really eaten it much but I’ve made 3 or 4 pestos lately. I have to say I like to add a little kick from some crushed red pepper on top of the pasta! Looking forward to your upcoming pizza! Your pesto looks lovely. It’s such a fab colour and when it’s so easy to make it’s so much better to make your own. I never thought of using a hand-held blender. That is a great idea, and I agree that making your own at home if 10x better than store bought. No problem Michelle, I love making it at home it’s 10x better than shop bought. Basil oxidises very quickly and turns brown, you’ll notice this happening to pesto too after a couple of hours but it’s totally fine to use. I would keep it in the fridge for 2 days, 3 max. If you don’t plan to use it straight away then you can add a thin layer of olive oil on top and you should get an extra couple of days on top of that or you could freeze it.